PLANET in PERIL, your "one-stop shop" for the truth about our planetary crisis. : Scientists cast doubt on claims by the chemical giant, Bayer, that its newest pesticide is safe for bees. Scientists cast doubt on claims by the chemical giant, Bayer, that its newest pesticide is safe for bees. away from the colony, are believed more vulnerable to pesticides. It's brand name is "Sivanto," (generic name, flupyradifurone). It's an insecticide, designed to kill a wide range of bugs which eat food crops. And Bayer has already registered it for use in some jurisdictions. After conducting various field studies, Bayer concludes, "Sivanto displayed a very promising safety profile." 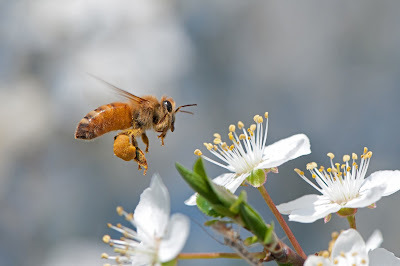 The company concedes, while it works in ways similar to the neonicotinoids (a group of insecticides which has become notorious for its likely role in pollinator decline), "It can be considered safe to most beneficial insects, specifically pollinators." A ground sprayer applying pesticides. A PinP photo. But a team of scientists at the University of California, San Diego, is not so sure. In recent research, the team gave a range of Sivanto doses to the bees, including some at levels that they encounter in the field. By itself, the chemical did not appear to be harmful. But, when combined with the fungicide propiconazole (brand name "Banner Maxx"), widely-used by farmers, the harm was "greatly amplified." The bees either sickened or died, apparently because the fungicide weakened their ability to shake off the toxicity. It's not uncommon for pollinators to be subjected to a dizzying array of pesticides all at once, while foraging in the fields. It’s a process called "synergism," in which they can suffer harm they would not, if exposed to just a single one. The spokesperson for the team, Dr. Simone Tosi, tells PinP, she does not believe that regulations in the US require manufacturers to test for synergistic effects when they apply to have their products approved. But neither does she think that such regulations prohibit such testing. In a news release, her team says, "We believe this work is a step toward a better understanding of the risks that pesticides could pose to bees and the environment. Our results highlight the importance of assessing the effects pesticides have on the behaviour of animals, and demonstrate that synergism, seasonality and bee age are key factors that subtly change pesticide toxicity." They call for further studies to better assess the risks to pollinators. Meanwhile, Bayer's marketing plans for its new product are ambitious. It promises to "develop, register and sell" Sivanto in many places across the world, including the US, Europe, Asia, Ghana and Brazil. While Canada isn't mentioned, specifically, there seems little doubt it will end up here, too. The German-based multinational says it wants to see its product "in all major climatic zones allowing agriculture." Experts sound alarm bells over another important farm chemical. 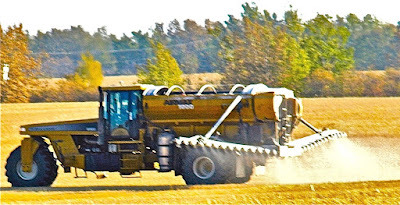 fungicide which remains in use in Canada today. Ottawa remains silent.